I'm kind of impressed that 20+ years later the Smurfs are still going strong and a children favorite! 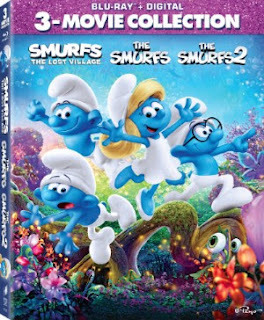 SMURFS: THE LOST VILLAGE is also available on July 11 in THE SMURFS 3-MOVIE BLU-RAY COLLECTION, which includes The Smurfs and The Smurfs 2. In this fully animated, all-new take on the Smurfs, a mysterious map sets Smurfette and her best friends Brainy, Clumsy and Hefty on an exciting and thrilling race through the Forbidden Forest filled with magical creatures to find a mysterious lost village before the evil wizard Gargamel does. Embarking on a rollercoaster journey full of action and danger, the Smurfs are on a course that leads to the discovery of the biggest secret in Smurf history! Directed by Kelly Asbury (Shrek 2) from a screenplay by Stacey Harman (“The Goldbergs”) and Pamela Ribon (Moana) and based on the characters and works of Peyo, SMURFS: THE LOST VILLAGE is produced by Jordan Kerner and Mary Ellen Bauder Andrews; with Raja Gosnell and Ben Waisbren serving as executive producers. Based on the characters and works of Peyo. Music by Christopher Lennertz. Imagery and Animation by Sony Pictures Imageworks Inc.
My boys and I have officially watched this movie every single night since it arrived in my mailbox! It starts off by telling you the name of some Smurfs, Brainy Smurf because he is smart, nosy Smurf because he is Nosy, Clumsy Smurf because he is Clumsy and so on. Then you get to Smurfette and they can't really figure out what her thing is! In a beautiful adventure where the Smurfs save the day we find out exactly what a Smurfette is. This is a great story about friendship, working together and doing the right thing. And it is also a story about being who you are.